Available from Amazon.com and other distributors. Discounts for schools available. Contact the FOA. An up-to-date reference on fiber optic testing for the contractor, installer, designer and user. Fiber optics has become the backbone of all communications systems, including telecom – landline and wireless - the Internet, CATV, LANs, etc. All these fiber optic cable plants and networks require testing to ensure they are installed properly and to troubleshoot problems when they arise. Fiber optic manufacturers and network users say that testing is the most important aspect of installation and operation but often the least well understood. Of all the technical help requests received by the FOA, 90% are about testing. This book has been written by the FOA to provide a comprehensive but understandable technical guide to this important topic. The FOA has always tried to provide the world with sources of technically correct unbiased information on fiber optics using both print and electronic media. For such a broad subject as testing fiber optic networks, we depend on the expertise of our amazing advisors - dozens of experts in the field with decades of experience. We also use the FOA Online Reference Guide on the FOA website (www.foa.org), the largest and most widely used reference on fiber optics to supplement the material in this book. 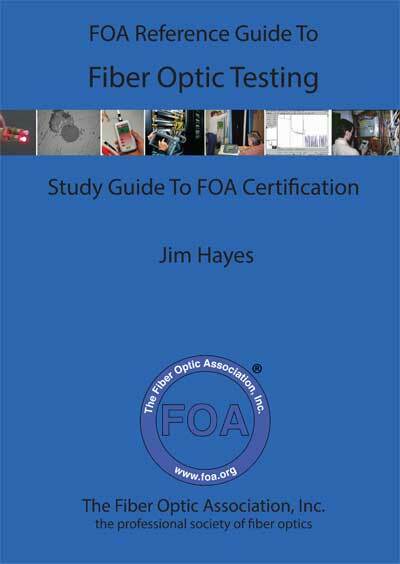 This book and the FOA Online Reference Guide provide a basic reference for testing fiber optic networks and a study guide for FOA Fiber Optic Specialist Certification in testing. The FOA Reference Guide To Fiber Optic Testing is a unique book. It covers the topic of fiber optic testing more thoroughly than this topic has ever been covered in a textbook before and in some different ways. Every subject (see Table of Contents below) starts with basic information on why this test is necessary, what test equipment is required, expands on how the tests are performed then completes the topic by discussing the potential measurement uncertainty and how to minimize that uncertainty. Several chapters are at the expert level. Chapter 10 on fiber characterization is technically complex but a subject that is becoming more important for upgrades to older cable plants and new installations intended for 100G and beyond. Chapter 14 on Metrology - the science of measurements - is the longest and most difficult chapter to master. This chapter is aimed at the experienced tech who wants to understand the depths of fiber optic testing and use that information to make their testing more accurate and usually much faster. The new FOA book uses state-of-the-art "publish on demand" technology where the book is printed when you order it using the latest printing technology. This new technology is less expensive than conventional publishing plus the cost of inventory is no longer an issue for books. We can update the book easily to keep up with new developments in technology, applications, and FOA programs. And using a web ordering and delivery system saves even more costs associated with the overhead and distribution of a conventional publisher. The FOA, a real non-profit organization working for the good of the industry, is passing these savings directly on to you! The FOA Reference Guide To Fiber Optic Testing has a companion curriculum available from the FOA for trainers who want to teach for the FOA CFOS/T certification. It includes an instructor's guide, PowerPoint Slides, Student Lab manuals, etc. Here is more information on FOA Curriculum. Jim Hayes, current FOA President, has over 35 years experience in the fiber optic communications industry as an technologist, entrepreneur and trainer. He is a co-founder of the FOA, author of nine textbooks on fiber optics and a columnist for several trade magazines. Order Single Books direct from Amazon.com and other distributors. Order the Kindle edition from Amazon.